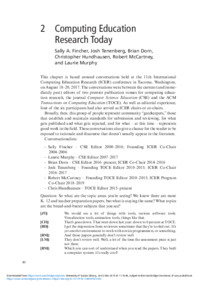 This chapter is based around conversations held at the 11th International Computing Education Research (ICER) conference in Tacoma, Washington, on August 18– 20, 2017. The conversations were between the current (and immediately past) editors of two premier publication venues for computing education research, the journal Computer Science Education (CSE) and the ACM Transactions on Computing Education (TOCE). As well as editorial experience, four of the six participants had also served as ICER chairs or co- chairs. Broadly, then, this group of people represent community “gatekeepers,” those that establish and maintain standards for submission and reviewing, for what gets published and what gets rejected, and for what – at this time – represents good work in the field. These conversations also give a chance for the reader to be exposed to rationale and discourse that doesn’t usually appear in the literature.